Long Message for Girlfriend : Girlfriends are sweet, cute, adorable, lovely, beautiful but at the same time, they are little emotional and sensitive too. They want your attention and affection. They are happy when you take them out, buy them things they like and talk sweetly to them. But they are delighted when you take some time to make some wonderful long love messages and send them cute love paragraphs. It could be funny lines, romantic love words, words of appreciation or even love texts for her to admire and remind her to take care. Here are some long love messages for your girlfriend, long love messages for her from the heart, and cute love paragraphs for your girlfriend. Why long messages? Because, the longer your message is, the longer the hug you are getting from her! 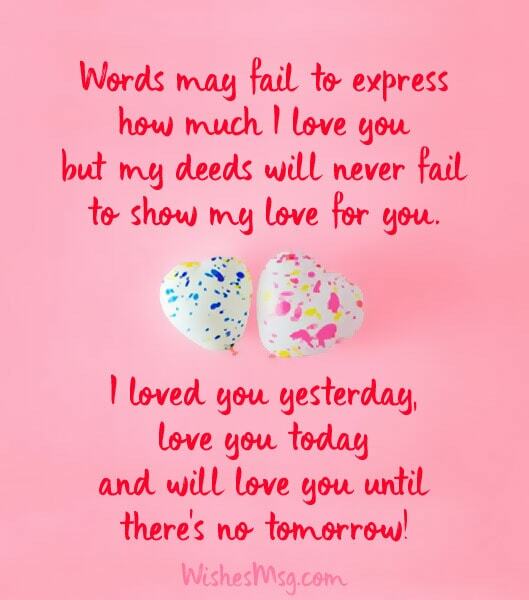 Words may fail to express how much I love you but my deeds will never fail to show my love for you. I loved you yesterday, love you today and will love you until there’s no tomorrow! You are the sunshine that fades all the darkness in my life. You are my road to redemption. I have never loved someone so deeply than you. I love you more than I can say. Nothing can ever change my love for you! When I first saw you, I was attracted by your beautiful face and your charming smile. But it was the beauty of your heart that I fell for. I found an angel in you that is more amazing than what’s visible from outside. You have a very distinctive pair of eyes. Whenever I look into them I find myself lost in an ocean of infinite hope, happiness and peace. This hope keeps me alive, that happiness surrounds me every moment in my life and that peace reminds me that I’m in heaven. I never believed that any person other than God can give meaning to my empty life. But when I met you, I realized God had a special plan for me. He sent an angel in disguise of you to make my life beautiful. I love you! I can create another odyssey describing my love for you. You have such a profound influence in my life that I cannot erase the memories of you even if I live for a million years. I am lucky to be part of your life. I will love you till my last breath! Your sweet smile is my inspiration for starting every day with new hopes and dreams. Your sweet voice is the reason why my life is so peaceful. Thanks for coming into my life and making it more wonderful than ever. I owe you everything! Loving you is like an addiction to me. Every moment I spend loving you is like the moments I spend in heaven. The day I will stop loving you is the day I die. I love you more than myself. keep up that sweet smile in your face always! Every morning when I wake up the first thing hit my mind, is you. I close my eyes and picture your beautiful face in my head so I can start the day full of positivity. I feel lucky to have you in my life. You are a blessing that I will be thankful to God for the rest of my life. My life was incomplete before you came into it. Since I met you, my life has changed completely. You are like a flower that has many fragrances in it. Thanks for decorating my life with the colors of your love. I love you! I never thought of falling in love with someone I barely knew. Then suddenly I met you one day and something in my ear whispered that this is the girl that I have ever wanted in my life. Since then, all I know is that I love you and want to be with you forever. I fell in love you and fell so deep down that nothing in this world can pull me up from here. I thought heaven was up in the sky but now I know heaven is falling deep down into love. I wish to be with you till the last moment of my life! You and I, both ending up together was not an accident. Our story was written in the stars even before we met each other. I thank god every day from the core of my heart for this! I wish you knew how much I adore you. I love you! You can find a thousand definition of love in the dictionaries. but trust me, the kind of love I have for is different. Even an entire lifetime will not be enough to make you understand how much I love you. Just know that you are special to me! Love is not something that you can express in words. Love is something that is expressed by actions and felt with the heart. I don’t know how much loved I make you feel but trust me, dear, you are the most precious thing in my life. I love you! I never learned how to live without you and still be happy. 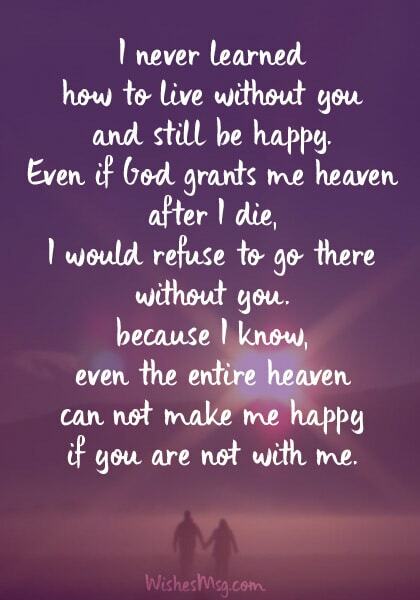 Even if God grants me heaven after I die, I would refuse to go there without you. because I know, even the entire heaven can not make me happy if you are not with me. Someone should have stopped me from falling in love with you. Now I am so lost in loving you that I can barely separate my soul from yours. If this is not called true love, I don’t know what else is! I am so attached to you now that only death can separate us from each other. Every moment I find myself thinking about you. You have become the reason for my smile, the meaning of my life and the inspiration for tomorrow. If God had ever made a Barbie doll, it would be you. But he created you as a girl. I think God wanted to balance out the roughness in me by sending a cute angel in my life. I love you so much dear! 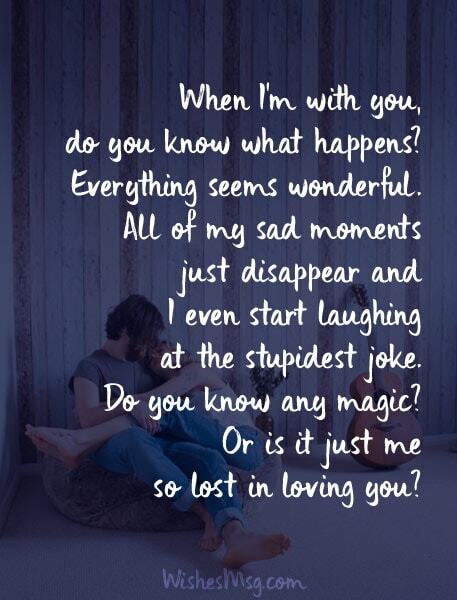 When I’m with you, do you know what happens? Everything seems wonderful. All of my sad moments just disappear and I even start laughing at the stupidest joke. Do you know any magic? Or is it just me so lost in loving you? True love comes at the most unexpected moment and it costs nothing at all. But what is even more interesting is that for some people, it comes with a package full of cuteness. I belong to those lucky ones. I love you! It’s a pleasure for the eyes to see you smiling. I have never known anyone with such a cute smile on her face. I would die and come back a thousand times to see you smiling in this way. I love you cutie pie! The day I don’t wake up seeing your beautiful face is a day so fruitless and futile. If you knew how much my heart craves for you, you would never keep yourself away from me. I love you truly, madly and deeply! I never believed in true love until I met you. Since then, loving you has become the only truth in my life. My world is so dreamlike now and all I dream of is you! Only God can wake me up now! Take some time, select the sweetest long texts to send to your girlfriend from here, send her and let the magic begin. Be sure that next time you meet her, the first thing she will do is give you a long and romantic hug!